Laura Davidson is the founder and CEO of a social fitness app, WHISTLE. WHISTLE app brings fitness enthusiasts together by connecting people looking for a workout partner. Laura and her team are dedicated to making fitness social, and bringing a sense of community to your workouts. Laura Davidson has no formal education or background in tech, yet she had a problem she needed to solve – finding a workout buddy to keep her accountable at the gym. Entrepreneur and former Facebook director of market development, Randi Zuckerberg, once tweeted, “The entrepreneur’s dilemma: Maintaining friendships. Building a great company. Spending time w/family. Staying fit. Getting sleep. Pick 3.” The tweet resonated with a lot of people, especially female entrepreneurs. When it comes to building a successful career, living a balanced lifestyle can be difficult. It’s something 28-year-old Laura Davidson noticed in her own life working at a fast-paced venture capital firm run by Kevin O’Leary. 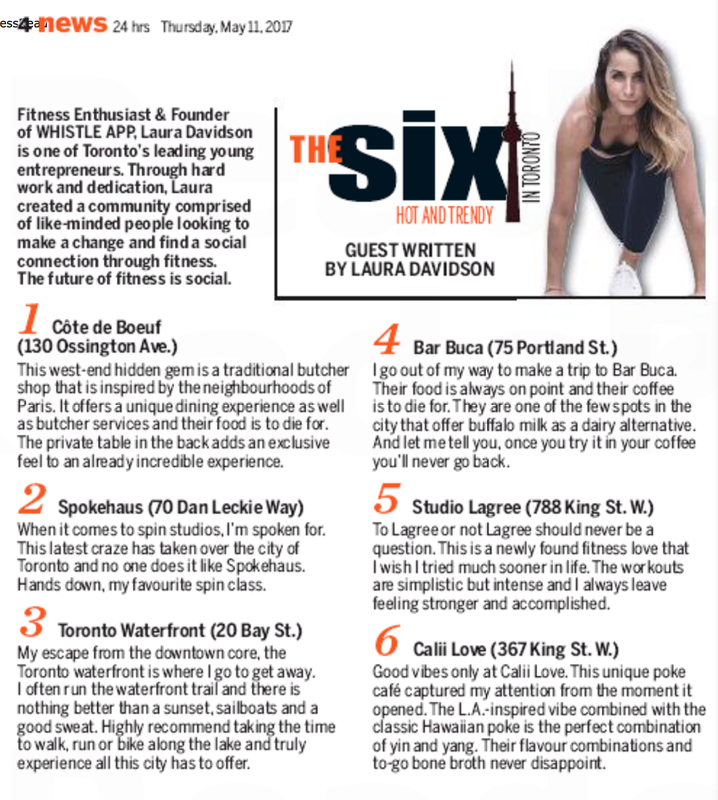 "Fitness enthusiats and founder of WHISTLE App, Laura Davidson, is one of Toronto's leading young entreprenuers. Through hard work and dedication, Laura created a community comprised of like-minded people looking to make a change and find a social connection through fitness. The future of fitness is social."